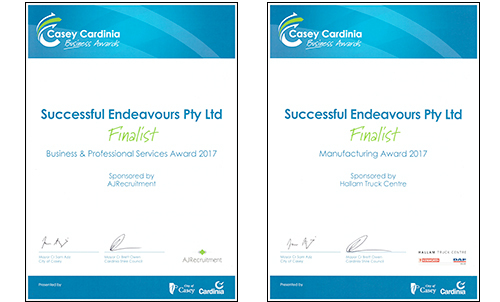 Successful Endeavours has again been nominated for the Business and Professional Services Award and the Manufacturing Award at the Casey-Cardinia Business Awards 2017. The finalists were announced at the Casey Cardinia Business Breakfast held on 6 September 2017. The winners will be announced at a Gala Dinner later in October. You can read more about the nominations and all finalists in our blog post "Successful Endeavours Finalists in Casey Cardinia Business Awards 2017".